San Diego State University announced Wednesday that school officials want to find people who attended a 1964 speech by civil rights leader Martin Luther King Jr. at the Open Air Theatre on campus. Seth Mallios, chairman of the SDSU Anthropology Department and the school’s historian, is hoping to collect both memories and memorabilia from the talk nearly 50 years ago. 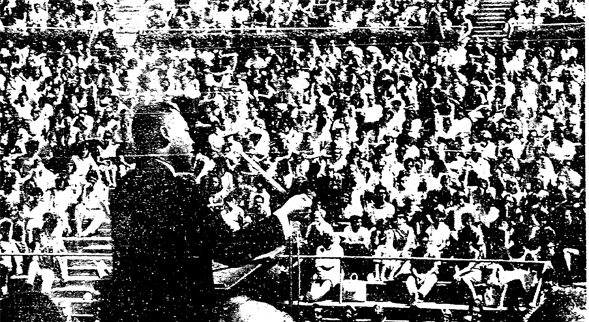 This scanned San Diego Union photo is the only image SDSU has of Martin Luther King Jr.’s historic SDSU speech. Photo from SDSU Newscenter. 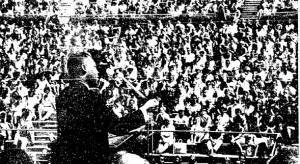 School officials have located only two of the estimated 4,000 people in attendance, and possess only a grainy newspaper photograph of the event, which took place on May 29, 1964. He said the visit to campus by King ranks among the most important events in the university’s history. It came one year after President John F. Kennedy gave the commencement address — of which the school has plenty of artifacts. “I desperately hope that local community members have some mementos from this event that will shed light on the civil rights movement in San Diego and on Dr. King’s vision for racial harmony across the nation and world,” Mallios said. SDSU plans to observe the 50th anniversary on April 30, before its annual Diversity Awards program. School officials are asking community members with personal experience — or who may have anecdotal stories from King’s SDSU visit — or have photos or memorabilia, to send an email to community@sdsu.edu or call (619) 594-3952. Photos and memorabilia shared by the community may be posted online or displayed during the April 30 ceremony, SDSU officials said.